Celestron PowerSeeker telescopes are very popular for those who want to star-gaze with an astronomical instrument that will produce brighter views of celestial objects inside and outside of our Solar System in comparison to most beginner’s telescopes. The main reason is because of their larger optics. The Celestron PowerSeeker 114 telescope offers up a 4.5” mirror as its light-gathering source, and the Celestron PowerSeeker 127 telescope is even more powerful, with a larger 5” mirror for capturing the light from distant galaxies, nebulae, and star clusters as well as showing more detail on Saturn, Jupiter, and other planets in our local celestial neighborhood. Once you open the box of your PowerSeeker 114 or PowerSeeker 127, you will notice that there are several accessories included to let you use the telescope that very first night. However, just like any hobby, extra accessories will increase your pleasure and help you to enjoy your telescope to its fullest potential. There are hundreds of telescope accessories to choose from, and we understand that choosing the right ones for your Celestron PowerSeeker 114 or 127 is a little overwhelming. To help make things easier (and less expensive!) we have put together a Celestron PowerSeeker Accessory Bundle, which includes several items that would be at the top of our list if we were recommending them separately. An Extra Eyepiece! The most important accessory for any telescope is more eyepieces. The telescope collects the light of an object, but the eyepiece is your window through which you look at that object. Each eyepiece gives you a different view, and the more choices you have, the better. 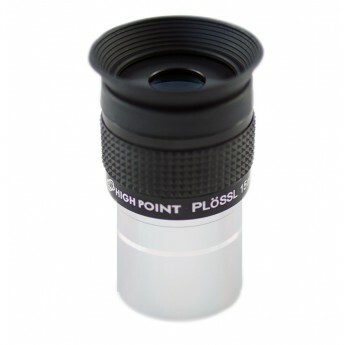 We have included a 15 mm Plossl eyepiece in the PowerSeeker Accessory Bundle. This medium-power eyepiece uses four fully multi-coated elements in its optical design, and the lens edges are blackened to reduce internal reflections from outside sources. The field of view through the High Point 15 mm eyepiece is 52-degrees, and you’ll enjoy the comfort of the rubber eyecup and a generous 13 mm of eye relief. A Moon Filter! If you have already looked through your Celestron PowerSeeker, a likely first target would be the Moon. The moon is a beautiful sight through any telescope at any phase, but boy, is it bright! So bright, in fact, that to see all the cool lunar features, you really need to tone it down a bit. 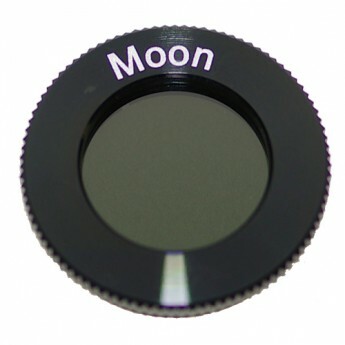 That is where a Moon Filter comes in, and that is why we have included a 1.25” Moon Filter in our Celestron PowerSeeker Accessory Bundle. Just screw it onto the barrel of any 1.25” eyepiece (including the 15 mm that comes with this bundle and the 20 mm that came with your PowerSeeker 114 or 127 telescope), and then put the eyepiece into your telescope focuser as usual. Now your eyes can relax, and details that were blown out by too much light will come into view, including craters, mountain peaks, the darker markings of maria, and the wealth of delights along the terminator (the line where the “dark side” and the light meet). A Moon Filter works great on Venus as well; when the brightness of the runaway greenhouse effect is subdued by the filter, you can see which phase she is in. A Motor for Your PowerSeeker! Have you ever noticed how fast objects move out of the view of your eyepiece? Just try to study Saturn’s rings for any time at all, and you’ll know what I mean. Every minute or so, you’ll have to stop what you’re doing and re-center the planet in your eyepiece. It’s not the end of the world, we know, but it can get annoying, especially when you have guests waiting while you make the adjustments. 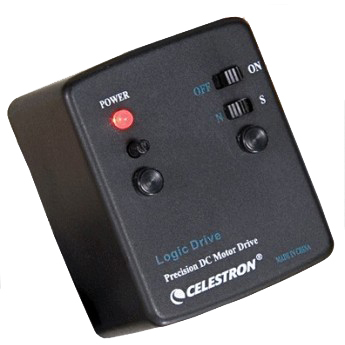 Happily, there is an easy fix, and that is why we have included a Celestron Precision Motor Drive in the PowerSeeker Accessory Bundle. Normally, the equatorial mount of your Celestron PowerSeeker 114 or PowerSeeker 127 telescope is manually adjusted with the slow motion control cables when you want to center an object in the field of view of the eyepiece. The cable that attached to the right ascension (RA) gear is the one that needs the most attention, because it controls your telescope’s east-west movements. Objects do change position in Declination, or north-south, but not nearly as much as the move from east to west across the sky, and so, if we let a motor automatically compensate for the rotation of the Earth (the cause of east-west movement), we will need to make far less manual adjustments. The Celestron Motor Drive is a great accessory for any equatorially-mounted PowerSeeker telescope, including, of course, the PowerSeeker 114 or the PowerSeeker 127. It is easy to install, and has just a few buttons and switches that are very straightforward. There is an off/off switch, a North/South switch (set it to N if you are in the Northern Hemisphere, and S if you are observing in the Southern Hemisphere), and a little dial that lets you adjust the speed of the motor. When you are observing the Moon, the maximum motor speed would be used. Planets move a tad slower than the Moon, but faster than “deep-sky” objects, and with the Celestron Motor Drive, it is easy to make adjustments as necessary. The Motor Drive runs on a 9V battery (not included), which makes it a very streamlined accessory for your Celestron PowerSeeker.